Ok. I missed the deadline for Ravelympics. But I am pleased with how the child's sweater I made came out. It is for the afghans for Afghans youth campaign: I used a vintage yarn called Marina under the brand name Bouquet. It is an aran weight superwash wool in a rich blue that an observer has called a Ralph Lauren blue. On a #7 needle and made in the hefty brioche stitch, the resulting fabric is dense and warm to stand up to an Afghan winter. It says 'boy' to me and at 30" across should fit a 7 - 10 year old depending of course on the size of the child. One thing I learned from Ravelry about this yarn is that it has only 85 yards per skein. I had over 9 skeins, but the skimpy yardage and the dense stitch explain why I feared running out of yarn after I started on the sleeves. I had a soft, heathery mystery yarn in a dark sand with subtle blue and orange touches, so I added a contrast stripe, saddles, and collar. It looks way better than I thought it would. 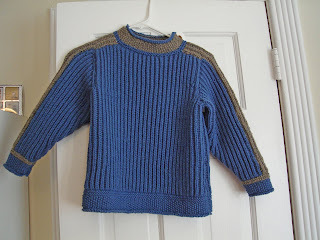 Would I have had enough blue without the intarsia stripe, etc? I think I would have run out near the end, certainly by the time I got to the collar. 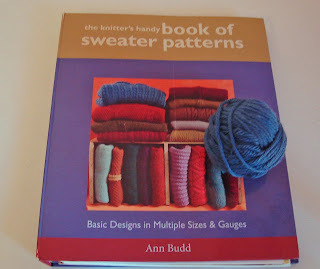 The yarn is posing on top of The Knitter's Handy Book of Sweater Patterns by Ann Budd. I roughly followed the proportions for the Saddle Shoulder sweater - Child. This is the first sweater and second project I have made using Ann Budd's garment outlines. The first was mittens. These pattern books come in handy, but they are not perfect. For the sweater, my gauge did not match any of those given in the book. I made so many changes that I feel like I wrote the pattern. Also, the neck was too small. I don't know whether to blame the book or myself. But no matter. I ended up leaving the collar open on the side and adding a loop and button closure, a nice solution. The photo shows the back of the sweater. Truly a stylish sweater. The contrast color saddle shoulder and sleeve band look made by design and blend perfectly well with the main color. I have only used Ann Budd's book for hats and one vest. The way gauge numbers are rounded up makes it very hard to get a precise fit and I also suspect her numbers work best for stockinette. I'll keep an eye out for this striking pullover on my next visits to the AFSC basement. Congratulations. The sweater turned out really well. 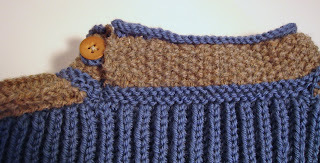 I like the way the contrasting yarn sets off that gorgeous blue.